Rediff.com » Movies » Bigg Boss 12: Who will get evicted this week? PREDICT! 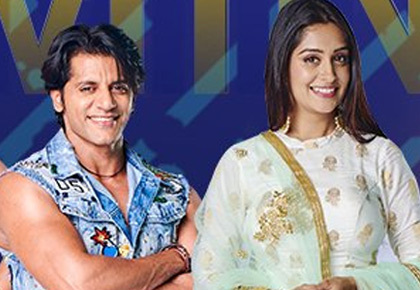 Is this Karanvir's last week in Bigg Boss 12? After Shivashish Mishra broke the rules of the Bigg Boss house, he was asked to leave the show. As part of the punishment, the remaining contestants were nominated for the next elimination. Romil Chaudhary was the only one exempted, as he is the captain of the house. In Monday's episode, the nominated housemates were given a task where three of them would have the opportunity to put themselves in the safe zone. A safe zone was created in the garden area, which had three chairs and flag posts. Dipika, Surbhi and Deepak were the first to enter the safe zone. After every gong, one of them had to leave the safe zone and give the spot to someone they thought was deserving. The entire house was seen strategising and convincing each other to gain a spot, except Karanvir Bohra who did not talk to anyone. After a lot of discussion, arguments and disagreements, seven contestants were nominated for eviction. Who will get evicted this week? PREDICT!